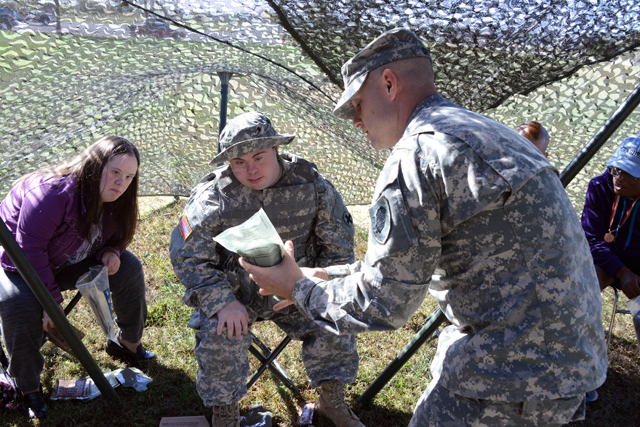 John Henley, a Special Olympics athlete from Marion, was honored as a Soldier-for-a-Day at Headquarters and Headquarters Company, 2nd Battalion, 130th Infantry Regiment based in Marion, on Oct. 16.
Henley suited up in uniform and was put through training Soldiers go through to stay ready for missions that lie ahead. Henley completed a modified Army Physical Fitness test, weapons training in a simulator, vehicle maintenance, along with squad tactics and a patrol. “My favorite part was hanging out with the big dogs and shooting,” said Henley. Staff Sgt. 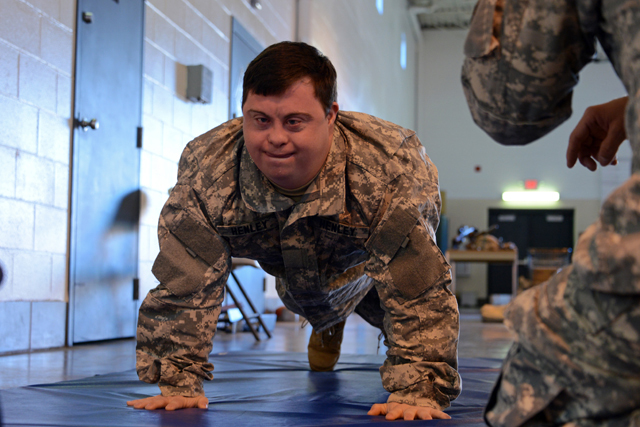 Beau Detrick of Marion, a recruiter with the Illinois National Guard Recruiting and Retention Command based in Springfield, said John Henley has been doing great things for the Special Olympics, not just in Marion but nationwide. “Soldiers are out there training, fighting the Global War on Terror and doing other humanitarian missions, but when we can bring it to the unit level and help out a community hero it is a true honor,” said Detrick. Henley, who visits the armory often, said he enjoys coming to see the Soldiers. During this visit Maj. Casey Kline of Marion presented Henley with a certificate making Henley an honorary member of the 2-130th. At the end of the day, Henley was honorarily promoted to sergeant by Kline for his outstanding leadership potential. 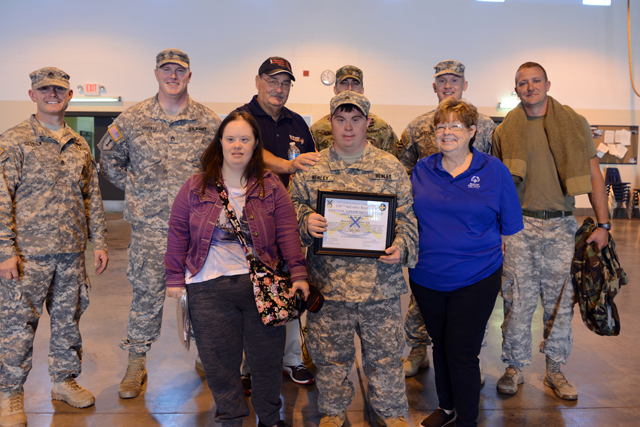 John Henley, a Special Olympics athlete from Marion, along with Henley’s father, Richard, mother, Jane, and girlfriend, Stephanie, pose for a photo with members of the Headquarters and Headquarters Company, 2nd Battalion, 130th Infantry based in Marion, after Henley was presented a certificate making him an honorary member of the unit during his visit to be a Soldier-for-a-Day on Oct. 16.
Henley said he plans to put the certificate next to his more than 125 Special Olympics medals in his room. 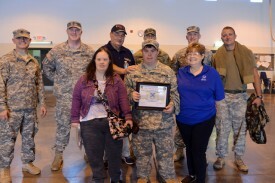 Henley’s parents, Richard and Jane, and his girlfriend, Stephanie, along with members of Henley’s Special Olympics team also attended the event to support John as he was put through the training.